WELLFLEET, Mass. 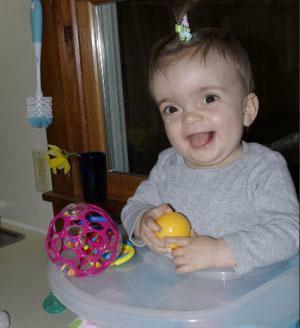 -- When 20-month-old Adelaida Kay Van Meter died of a rare genetic disease last winter, her father, Murro, gently carried her body out of the house to his wood shop in the pines near Gull Pond. He placed her in a small cedar box and surrounded her with ice packs. For three days, the little girl's grieving parents were able to visit her and kiss her and hug her. Then, on the third day, after the medical examiner came to sign the last bit of paperwork, Van Meter and his wife, Sophia Fox, said good-bye to their baby, screwed the lid on the box and drove to a Plymouth, Mass. crematorium, where they watched the little coffin enter the furnace. Well, it turns out that in most states it's perfectly legal to care for your own dead. And, with new momentum to shatter longstanding taboos and stop tip-toeing around death — from "death with dignity" measures sweeping the country to projects promoting kitchen table "conversations" about our deepest end-of-life wishes — a re-energized DIY death movement is emerging. This "personal funeral" or "home death care" movement involves reclaiming various aspects of death: for instance, keeping the dead body at home for some time rather than having it whisked it away; rejecting embalming and other environmentally questionable measures to prettify the dead; personally transporting a loved one's corpse to a cemetery; and even, in some cases, home burials. Families are learning to navigate these delicate tasks with help from a growing cadre of "death midwives" "doulas" or "home death guides." The DIY death movement is loosely knit, and motivations vary, ranging from environmental concerns to religious or financial considerations. (Traditional funerals can cost around $10,000 or more; when you do-it-yourself, the cost can be reduced into the hundreds, experts says.) Each case is fiercely personal — there's no playbook — but they all share a very intimate sense that death should unfold as a family matter, not as a moment to relinquish loved ones to a paid stranger or parlor. The highly personal nature of home funerals appealed to Janet Baczuk, 58, of Sandwich, Mass. So, when her 93-year-old father, Stephen, died in September, 2011, she said, "I thought, I'd like to do that for my dad." "It's more humane, more natural...and more environmentally sound." Baczuk and her sister washed their father's dead body using essential oils, and got a permit to drive the corpse to the cemetery in their (covered) pickup truck. A World War II veteran, Stephen Baczuk was buried at Massachusetts National Cemetery in Bourne, where officials allowed his simple pine and cherry casket to be placed directly on the ground, covered by an inverted concrete vault with no lid, "like a butter dish," Baczuk said. When her mother died back in 2006, Baczuk said, she had no inkling that home funerals were an option — but wishes she did. "I didn't know it could be done," she said. "I think a lot of lay people don't know this is legal or possible." "When it comes to death, it doesn't matter where you are on the scale of education or socioeconomics, many people are shocked to find that it's legal to care for your own dead at home," says Josh Slocum, Executive Director of the Funeral Consumers Alliance, a Burlington, Vermont, nonprofit that works on all aspects of funeral education, from helping consumers reduce costs to advocating on DIY methods. "And I think this speaks to how distant death has become for us in just over a century. In the late 1800s, even turn of the century, caring for the dead was as prosaic and ordinary as taking care of the children or milking the farm animals." Slocum offers this analogy: If a woman wants to run a restaurant, she needs approval from the health department and officials, of course, would be permitted to inspect her kitchen. But the health department would have no jurisdiction over the same woman's own kitchen at home. "They cannot come in and tell her that her refrigerator is subpar, and they have no authority to tell her she is not allowed to cook dinner for her kids. They can't compel her to order dinner from a commercial, licensed restaurant," Slocum says. "The same holds with state funeral regulatory boards. Their job is to ensure public welfare and protect paying consumers. Bizarrely, however, many think their jurisdiction extends to telling families they must pay an unwanted third party funeral home to do something the family could do for themselves." • In northern California, Kimberlyrenee Gamboa's son Kyle committed suicide by jumping off the Golden Gate Bridge in September, three weeks into his senior year in high school. A seemingly happy 18-year-old with lots of friends and into competitive lasertag, Kyle's death was such a shock, his mother said, she doesn't know how she'd have managed it through a typical funeral. Instead, with help from her church and and home death guide, Heidi Boucher, Kyle's body was returned to the family home one day after his death. Boucher washed Kyle and helped arrange the body on dry ice changed every 24 hours; she gathered information to fill out Kyle's death certificate and managed all coordination with the mortuary. 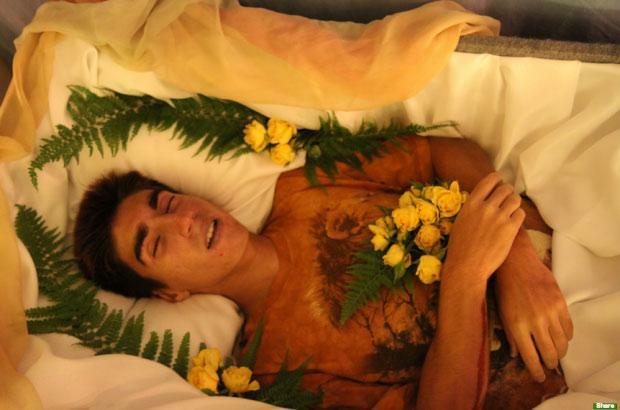 For three full days, Kyle's body lay in the family living room in an open casket, not embalmed. During that time, day and night, surrounded by pictures and candles and flowers, all of his friends and family could say good-bye and remember his short life. For Kyle's mother, that time was critical to her healing. "If I had to hand him over to funeral parlor, have him embalmed and get two hours on a Tuesday afternoon for everyone to see him — I couldn't have done that," she said. "It would have been extremely hard, not only for me, but for everyone who knew him...I still have my ups and downs, but I had three more days with my son — of him physically being there and accessible to me. I didn't want to leave the house because I knew these were my last three days with him. Until you go through it, you don't realize how very important that time is for your healing." • Kanta Lipsky, a yoga teacher in West Tisbury on Martha's Vineyard, compared her 66-year-old husband John's "home death" to a "home birth." "A couple of days before I could see it coming," Lipsky says. When he died of cancer in March 2011, she said, a nurse from the local hospital prepared his body. "We did a very beautiful ceremony at the house. Friends came over to wash John's body, a rabbi said prayers during the washing. There was lots of water and towels all over the floor. We put him in the traditional Jewish white loose pajamas; my tradition is Hindu, so we placed rice balls in the casket and had a garland of roses. We did a waving of lights and we all sang — there were 20-25 people in the house. He was wrapped in beautiful comforter, and we lifted him up and passed him hand to hand through hallway. It was very moving...It was like a home birth, but it was a home death, very hands on...there were no rules, it just unfolded, evolved and we all felt really comfortable with it...it was such an easy slipping out, his spirit just slipped right out and we were with him, it was a part of life." • In Hubbardston, Mass. near Worcester, it took three months of haggling with town officials before Paul Flint was allowed to bury his 14-year-old stepson, who died in a car accident in 2011, on the family's property. Because the accident happened in Minnesota, Flint said, the family was keen on having the boy, Daniel Davis, laid to rest at home. "My wife wanted him buried on the property," Flint said. "There's a couple of favorite spots he liked and he's buried there, near the rope bridge across the creek." Even Bill Cosby chose to bury his son the family property in Shelbourne, Mass., "beneath the hills and trees where young Ennis played as a child." Obviously, families taking care of their dead loved ones isn't new. Indeed, it was the norm until the last quarter of the 19th century, when a burgeoning funeral industry evolved. Today, "the funeral business is so effectively insulated from free-market competition that many families can’t even imagine a funeral home free of faux-Victorian sitting rooms and a fleet of Cadillacs," writes Slocum, also the co-author of Final Rights: Reclaiming the American Way of Death. We'd never put up with this in any other sphere; it would be laughable to contemplate state workers going around forcing citizens to go to Jiffy Lube instead of changing their own oil, or to hire licensed daycare workers instead of staying home with the kids. But that's what some funeral boards do. The only reason we accept this is that we're so psychologically removed from and afraid of death that we assume such absurdities are normal even when we'd recognize how ridiculous they are in any other context. But emotional complexity is another story. Many people are profoundly grateful to leave funeral arrangements to outside professionals. Still, there's often an assumption that the grieving are simply too fragile to cope with death head on. While caring for his wife through late stage melanoma, another Cape Cod man, Grey, made a decision: in discussions with his dying wife and daughters the family decided to keep her body at home after death. But when Grey told a hospice worker what he planned to do, he said the worker spent half an hour on the phone trying to talk him out of it: "She said, 'You're going to be distraught and you're going to have your wife's dead body in the house and...you may think you can handle this, but so many things can go wrong, I think you should reconsider.'" In the end, though, Grey stuck to his plan: he had attended to his wife at home through her brutal illness, and it was almost a relief (at least for a short time) to care for her after death, when she was no longer in pain. Grey and his daughters bathed her body with lavender oil, built her a cedar coffin and watched over her for three days in the house before taking her to the crematory. "We all felt it was a very important ritual. I'm glad we did it that way," he said, but noted, "it's definitely not for everybody." At their fourth annual meeting last month, about 70 home death guides, hospice nurses, doctors, students and funeral directors met in Raleigh, North Carolina, to talk about home death care and green burials, among other topics, says Lee Webster, vice president of the NHFA and a home funeral guide in Plymouth, New Hampshire. They also tried to figure out a way to more systematically collect data on home death care and build a central repository for consumer information. Webster, a longtime hospice volunteer, says while data-gathering remains tricky, it's clear the movement is growing. "There's an explosion" of interest in home funerals or blended, hybrid funerals with some elements done personally and some left to traditional funeral directors, she says. What's driving this explosion? It's a Boomer thing, according to Webster. "This is the generation that fought for breast-feeding in public and home births; and they want to bring back the idea of a natural death. It's the ethic of this generation." Cost and the environment are also driving factors. People like the idea of "fewer chemicals, no rainforest woods and Chinese steel," Webster says, noting that when you avoid embalming you're not "draining blood into the public septic system and not subjecting loved ones to violent procedures — the embalming process is quite brutal — just for cosmetic reasons and for no health benefits." Webster adds: "Once people's fears are relieved about body care, body mechanics, smells and fluids, a light goes off and they say, 'Why would I not want to do this?" Even while many of us shudder at the prospect, Webster says the dead "can be very beautiful. To go back to the birth model: it's like birthing people out in as natural a way as possible." You might think there'd be some funeral industry push-back against all this embrace of more personal, no-frills death care. (Of course, with no national numbers, it's hard to know how many people are actually embracing the trend.) Still, it doesn't seem like the industry is particularly threatened. Daniel Biggins, a second-generation funeral director in Rockland, Mass., and spokesperson for the National Funeral Directors Association, said he doesn't have any direct experience with families interested in home funerals, but has no problem with people making their own choices. Indeed, he said, more families want to personalize even traditional funerals to better reflect their lives. For instance, he said, last year he helped arrange a memorial service at a local golf course. The dead man, a golf fanatic, was cremated and placed in a biodegradable urn in the main pond at the course. "Several hundred people gathered around the pond," Biggins said. "And all his friends hit a golf ball into the pond with a personal message as a final goodbye." Heidi Boucher, who says she's helped over 100 families care for their dead loved ones, is completing a film, In The Parlour: The Final Goodbye, about the "resurgence" of the home death movement. A home death guide for over 25 years, she says: "I've watched from only a handful of us doing this in this country...to now, when it's become vogue. A lot of this generation, we're the ones who took control of where we're going to send our kids to school, what car to drive. Our generation is the one that wants to find out what's in it before we eat it." One problem is that states and local municipalities are all over the map when it comes to regulating death. There remain nine states with laws or other impediments (from requiring a funeral director's signature on a death certificate, to mandating that a funeral director be present at the final disposition of the body) that make it difficult for families who want to care for their own dead, Josh Slocum says. On the other end of the spectrum, the state of Massachusetts offers clear instructions for home funerals right on its website, including what you need for a death certificate, guidance on burials and preparing the body. "The human body decomposes rapidly after death," the website says. "Care must be taken to keep the body as cool as possible in order the slow the decomposition that results in noxious odors and the leakage of body fluids from body orifices. A human body can be kept in a cool room at least 24 hours before decomposition begins. Heat in the room should be turned off in winter, and air conditioning should be turned on in summer." But even in an evolved state like Massachusetts, many families' first reaction to home funerals is something like: "'You mean that's legal?!' says Heather Massey, a longtime home funeral guide who runs the education and consulting center "In Loving Hands" on Cape Cod. Massey says her goal is the creation of a robust home death support system, "a volunteer care circle, comprised of community members trained and experienced in home funerals, who can in turn assist and guide other families who wish to care for their own at death, thereby truly bringing this loving tradition back into the hands of family and community." 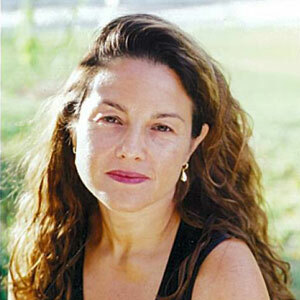 For Adelaida Van Meter's parents, taking personal control of their daughter's death was "imperative," said Sophia Fox. There were some obstacles, however. "I had several funeral homes tell me over the phone that what I was trying to do was illegal," Van Meter said. "I didn’t try to argue with them, I just hung up." Eventually, with help from a pediatric social worker and Heather Massey, the family was able to fill out all the required paperwork and keep the baby's body at home after she died. "The only news is that we continue to be head over heels in love with our daughter Annabelle, who is doing great. With that said, not a hour goes by that we don't feel the loss of Adelaida. So I guess these things would qualify as no new news." This program aired on November 22, 2013. The audio for this program is not available.